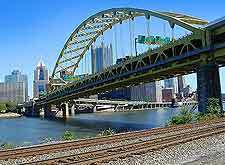 The modern day city of Pittsburgh was first settled by clans of the Iroquois Native Indians, who engaged in trading with other tribes. That was until European explorers, predominantly French explorers, spread disease and brought war to this area of southern Pennsylvania. Due to Pittsburgh's position at the fork of the Ohio River, both the British and French sought this region as the location of a fort stronghold. The French were particularly keen to control the area, seeing it as the ideal link between the French-owned Louisiana Territory and French Quebec to the north. Early Pittsburgh history saw the British become the first to build a fort here. However, Fort Prince George, built in 1754, was soon taken over by the French, who took control of the area and built an even stronger fortress named Fort Duquesne. In 1763, the French and Indian War between France and Great Britain ceased, and French troops left the area, burning down the fort as they vacated. Fort Pitt was built in its place by the British. Today, the Blockhouse of Fort Pitt, which ranks as the oldest building in the city, can be toured. The first industry within the 'Pittsborough' (as it was originally called) region was agriculture, although travel and shipping were hindered by the geographical presence of the Allegheny Mountains. The settlement therefore began to develop its own industries to sustain itself. Insight into the coal mining industry, which began in 1786, is available at Coal Hill (now Mount Washington). Glass manufacturing became popular from 1795 onwards, while boat building was a major industry in the 1800s. The Duquesne Incline funicular railway, built during this industrial period to transport goods to the top of Mount Washington, still exists. Pittsburgh became an incorporated city in 1816, due to its increasing significance and growing population. By the mid-1800s, coal was being shipped into the city in droves, as it was needed to fuel the glass, steamboats and ship building industries. The American Civil War saw Pittsburgh develop at an alarming rate, mainly because it had become cut off from the supplies of the East Coast. One of the most-loved buildings from this era is the Allegheny County Courthouse, which still operates as a government building and can be toured daily. Steel production began in 1875 when the Edgar Thomson Steel Works was established in the city. The enormous use of coal led to environmental problems, marking the start of a polluted era in Pittsburgh history. A black fog, commonly called smog, constantly hung over the city by the end of WWII, leading to the nickname 'Hell with the Lid Off'. At this time, the city attracted large numbers of Welsh coal miners from Merthyr Tydfil, who were encouraged to emigrate following industrial disputes in their hometown. WWII saw Pittsburgh increase steel production, but after the war the famous steel industry was overshadowed by efforts to revitalize and clean up the city. This rejuvenation is often referred to as the Renaissance project. Many public parks and buildings were built during the first step of the Renaissance, including Point State Park and the high-rise complex named the Gateway Center. The steel industry began to decline in the 1970s and 1980s, leading to economic pressures on the city. Between 1950 and 1980, the population of Pittsburgh dropped by some 200,000 residents, as the 'Rust Belt' syndrome set in across the Midwest. 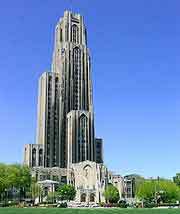 Nevertheless, the second stage of the Pittsburgh Renaissance was continued, with the city building major skyscrapers like the USX Tower (now the US Steel Tower) and the One Mellon Center (now the BNY Mellon Center). Pittsburgh has continued to move away from the steel industry and now incorporates both high-technology industry and medical research within its business portfolio. The city's history is proudly displayed at the Senator John Heinz History Center. In recent years, the success of local NFL team the Pittsburgh Steelers, who dominated the Superbowl from 1978 to 1981, along with the city's selection as a G20 host in 2009, has restored some pride to the city.